Have you ever wondered about flying bikes or did you ever wanted to ride the bike which can fly? Earlier, the bikes used to be ridden only on roads, but now surprisingly the technology had made them able to fly in the air. Recently, Russian tech company Hoversurf has built the flying motorbike and started the pre-booking of it. The flying motorbike has the maximum speed of 96 km/hr. It can fly up to 5 meters from ground surface. 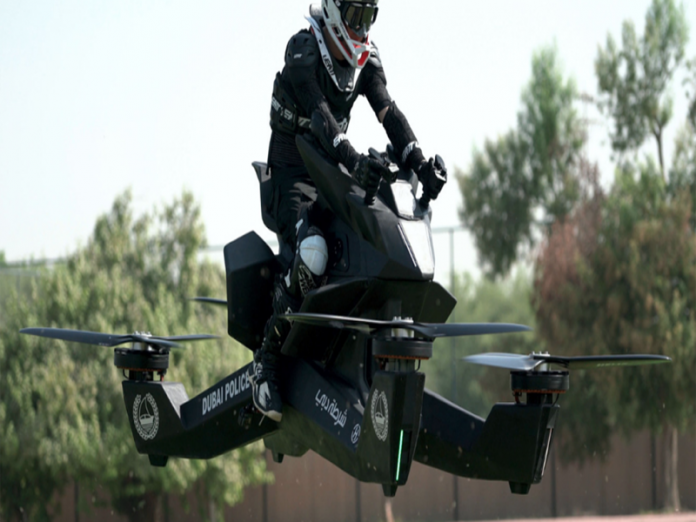 Dubai police force has already planned to use this motorbike, and they had started to train its officers how to pilot a new flying bike. As per the company, Each S3 2019 Hoverbike costs US$150,000.The bike can fly for just half an hour. Since the flying time of the bike is not so, great experts have stated that it can be risky for people to ride the bike. Dubai police have already found some weakness in the bike and have instructed the company for the improvement. Dubai police have especially suggested regarding battery structure and fiber frame for the improvement. Following the suggestion the company has equipped the bike with ‘Hybrid Lithium Magnesium Nickel’; the battery can provide the flying capacity up to 10 -25 minutes. Engineers have told that the motorbike can fly for 40 minutes if it is activated to ‘Remote Control Drone Mode.’ The bike can be parked even in the general parking. It can be highly useful for traffic polices who duties in the area with high traffic jams. According to the company, for the pre-booking of Hoverbike S3, 2019 customers have to pay 10 thousand American dollars. The bike will be delivered within 2 to 6 months of booking, informed the company. According to law, Hover’s weight should be 114 Kg. But the pressure can be increased if the capacity of the battery will be amplified. Federal Aviation Administration (FAA) of America had stated that the rider of the Hover would not require a pilot license. As per the directives of FAA, the flying speed capacity of the motorbike cannot be expanded more than 16km/hr. At the present scenario, the progress of technology has moved to an extreme pace. Just recently Xinhua – a state news agency of China has introduced the world’s first AI news anchor in its newsroom. The agency says that the anchor can read text mimic facial expression and impersonate mannerism as realistically as human. So much so they could threaten the job of presenter they are modeled of literally. The robot anchor made their debut in both English and Chinese script. The agency created their AI presenter with tech firm Sogou, using facial recognition, facial modeling and speech synthesis software. Meanwhile, human journalists are looking over their shoulders. China is considered the leaders in the AI industry, having already produced advance surveillance equipment and self-driving cars. Xinhua informed the AI technology is not limited to news anchoring. The systems can be customized to different clients and can be exploited in other industries and markets. Research firm Gartner made a prophecy that Artificial Intelligence will create 2.3 million jobs by 2020. At the same time, the firm anticipates AI to eliminate 1.8 million jobs over the same period. After looking at the AI news anchor innovated by China and Hoverbike built by Russian tech firm it proves that the world of technology has steeped to the next level. If the progress of technology goes at the same pace, then we can expect to see lots of incredible technology stuff in the future.